This is plate 19 from James Fergusson's 'Ancient Architecture in Hindoostan'. Chidambaram is the sacred spot where Shiva, in the form of Nataraja, danced his powerful cosmic dance. It has been a place of pilgrimage in Tamil Nadu since about the ninth century. The Shivakamasundari temple was built in the 12th century and is dedicated to Parvati, spouse of Shiva. It is one of the earliest buildings within the complex of the Nataraja temple, which was built in the late Chola era (12th to 13th century). It is a distinct unit with a surrounding colonnade and entrance gateway. 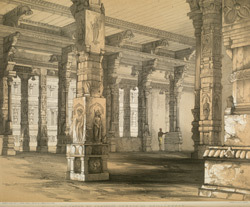 For Fergusson, it was the most interesting of all the temple sites he visited in south India.